I wonder how they got triplets if there wasn't artificial contribution, genetic history, and I wonder why can triplets not be identical, it's like twins with one more, so why no? they have to adjust to having twelve more siblings as well as possibly get taken care of their grandparents or uncles and aunts rather than their parents, also they have to share a lot of space due to how big the family is. Having triplets would be a handful-- literally. 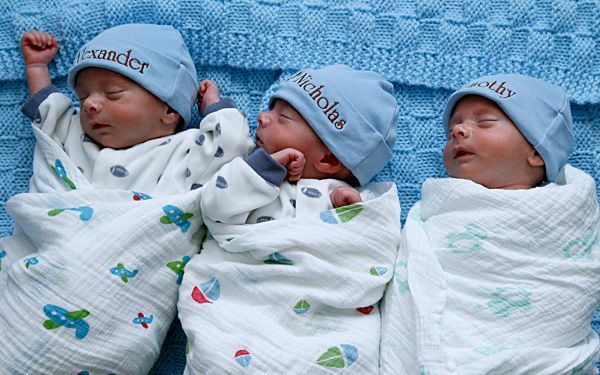 One in 60,000 to one in 2 million is a very rare chance to get identical triplets by natural conception. I would honestly hate to have triplets, but who knows-- maybe it would be great. I just don't want to find out for myself. This article is about a very rare case of a family who has a pair of triplets. Most pairs of triplets are born with the mother using fertilizers, but the mother claims she did not use it. But what made this group of triplets so rare is they were identical. Identical triplets are extremely rare and most doctors say they have never seen anything like this. They say this is more uncommon then a one and a million chance. Having three identical twins is very rare, but this family has to adjust at many things. You could actually realize how hard would this be for this parents. This can go either way when considering the pros and cons of this situation. It definitely is a good thing that she has a bog family like she wanted. They are also very lucky that they got such a rare birth. Yet, since these kids are all born at once, it might be hard for the parents to provide for them since babies are a lot of money. Raising one kid is hard enough, but 5 will be much harder and might take a toll on the parents. But, I am sure they will pull through and raise the kids very well. CTC: I believe that the two older brothers will have a hard time telling who is who as the triplets when they get older could do some very funny pranks to them such as changing names for a day or blaming another brother. 3 baby triplets were born in Henry Ford Hospital which was really rare. The hospital said that only 4 sets of triplets were born but only that one set of triplets were identical. Scientists said it is very rare such as a one in a million chance that this could happen. The two older brothers must adjust to many things. One thing they have to adjust to is not being able to have much attention because the babies are so young and there are three of them. Another adjustment they must make is adjusting to so many more children in the house all at once and not gradually.